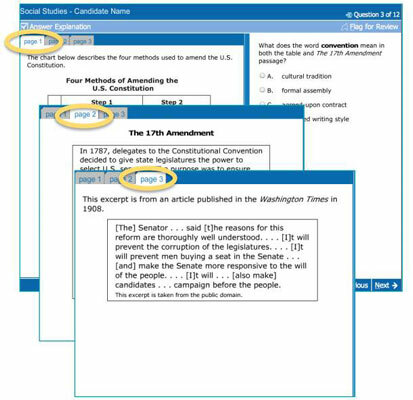 In the Social Studies section on the GED test, you’ll encounter all the same types of questions as you do on the other sections: multiple choice questions, drag-and-drop questions, drop-down menu questions and extended response questions. Here is a brief guide to the kinds of questions to expect. 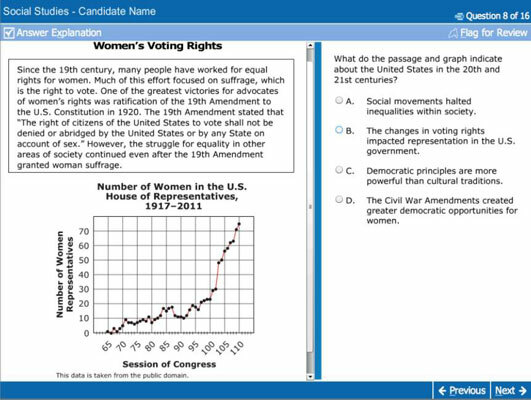 Most questions on the Social Studies section are a variation of multiple-choice questions. You’re probably most familiar with this simplest version. To answer this question, you click on the correct choice, and then click on Next to continue. Check your answer, read the explanation, and make sure you understand why you got the item right or wrong. You can often discover as much from getting an answer correct, and reading the explanation of why it’s correct, as in getting it wrong. 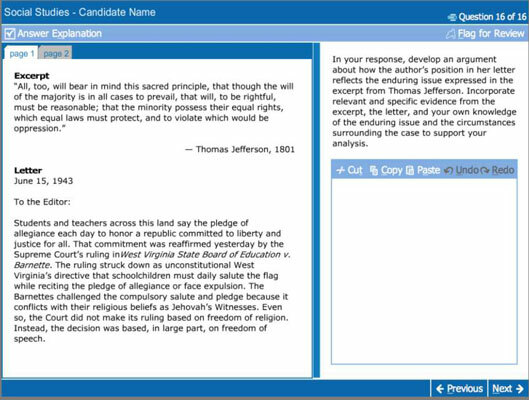 You’ll also find the multiple-choice and other items presented as a split-screen. In this example, the text exceeds one page but only by a little. A scroll bar on the text side lets you scroll down to see the entire item. 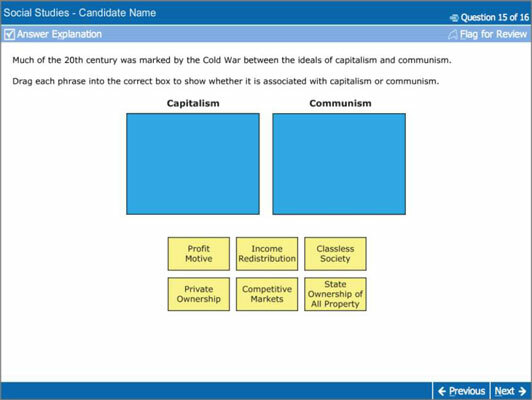 The other questions on the Social Studies section of the test are just like the ones you’ll see on the other sections of the test. They include questions with source text (the materials you need to read to answer the question) spread over several pages. The tabs on the top left of the screen indicate more pages of text. Each page is on a tab. You’ll also encounter fill-in-the-blank questions. On this type of item, you use the material presented in the passage to complete the box. As in other subject areas, you need a specific word or number for the blank. You must be accurate; spelling mistakes are scored as an error. Another type of problem is the drag and drop. You solve it the same way as the drag-and-drop problem on the Reasoning Through Language Arts section. 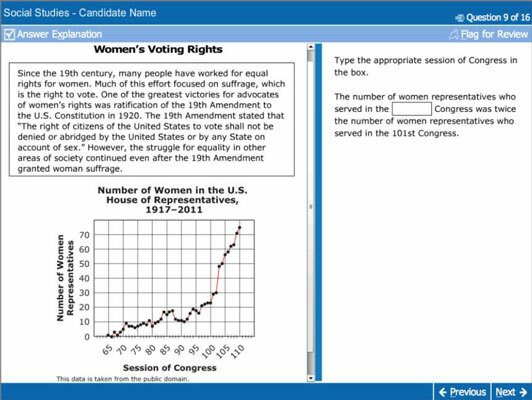 The Extended Response item also uses a format similar to that in the Reasoning Through Language Arts section. 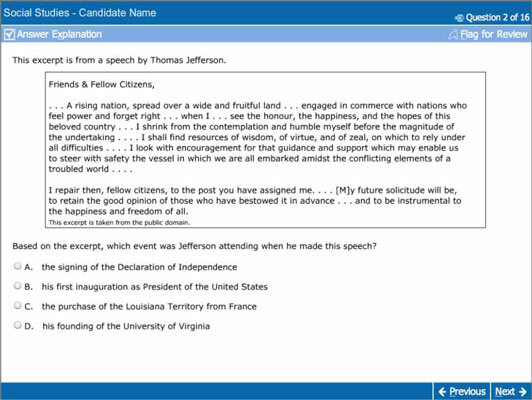 This item gives you several pages of source text and a window in which to write your answer. You can write your response on paper and ask one or two friends to grade it. If you’re taking a GED test preparation course, the instructor may grade it for you.